Amer Fort is located in Amer, a town with an area of 4 square kilometres located 11 kilometres (6.8 mi) from Jaipur, Rajasthan state, India. Located high on a hill, it is the principal tourist attraction in the Jaipur area. The town of Amer was originally built by Meenas, and later it was ruled by Raja Man Singh I. Amer Fort is known for its artistic Hindu style elements. With its large ramparts and series of gates and cobbled paths, the fort overlooks Maota Lake. It is the main source of water for the Amer palace. 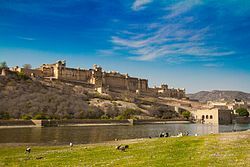 This article uses material from the Wikipedia article "Amer Fort", which is released under the Creative Commons Attribution-Share-Alike 3.0 License.